The All-Ireland winning captain was forced off in the first half of the Leinster semi-final against Longford. 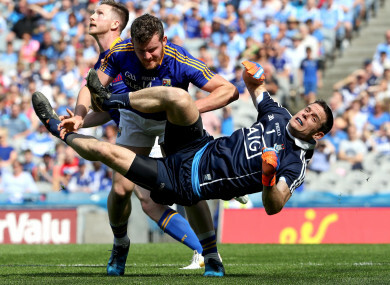 Stephen Cluxton was injured during the Longford match. IT WILL BE Stephen Cluxton’s call as to whether the Dublin All-Ireland winning captain is fit to play in next Sunday’s Leinster final. Cluxton was forced off in the first half of their semi-final win over Longford last Sunday week after a heavy challenge from James McGivney, which resulted in the Longford player being dismissed. The fitness of the 36-year-old will be assessed this week with Evan Comerford, who came on in that provincial last four tie, in pole position to start if the regular netminder is ruled out. “Obviously he received that bang so now he’s a little bit tender,” remarked Dublin boss Jim Gavin, at a press event this morning. “So we’ll make that assessment over the coming days. Yeah he’s been out with us (training). Stephen is a tough guy, mentally very strong (and) determined. Cluxton has been a permanent fixture for Dublin in the championship over the last decade and his absence would be a new scenario for Gavin to deal with. “We’ve given other goalkeepers opportunities to deal with as well,” stated the Dublin boss. “Evan would have played obviously two league games as well this year, did very, very well. “But yeah he (Stephen) has been consistently there and that’s a testament to his determination for his sport. Email “'It's a player's call, to say whether he's available for selection' - Dublin wait on Cluxton fitness”. Feedback on “'It's a player's call, to say whether he's available for selection' - Dublin wait on Cluxton fitness”.